"I won't do anything unless I'm mad crazy about the music and the composer and really feeling like they're contributing something to the field that is different," Beth Morrison says. 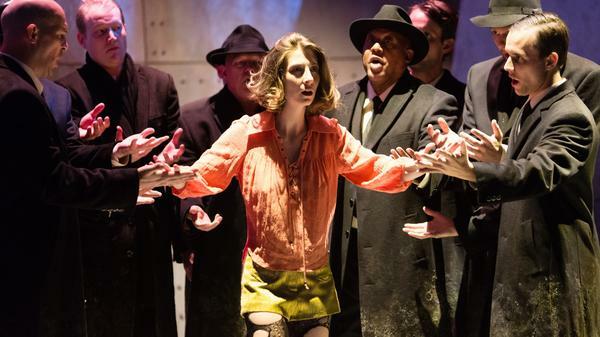 Breaking the Waves, Missy Mazzoli's latest opera, makes its New York premiere this year at Beth Morrison's Prototype festival. Classical composers have long had their patrons: Beethoven had Archduke Rudolph, John Cage had Betty Freeman. For contemporary opera composers, there's Beth Morrison. She and her production company have commissioned new works from some of the most innovative emerging composers today. Morrison is not your typical moneyed patron, though. "I didn't come from money and I didn't have money and I wanted to live in New York!" she says. She runs her empire from a two-bedroom walk-up apartment in Flatbush, Brooklyn. One bedroom in the apartment is for sleeping. The other is a workspace for her eight employees. "I've always run the business from my home, maybe much to the chagrin of my board," she says. "For me, the decision is always really clear: I could spend $30 to $40,000 on an office space every year, or I could put that into a commission." Morrison has commissioned works from David T. Little, Mohammed Fairouz and Missy Mazzoli. Mazzoli, whose first opera, Song from the Uproar, was produced by Morrison, calls her a true individual. "Beth has this famous boot collection that is just amazing — it blows my mind," Mazzoli says. "It's sort of a symbol of this commitment of being an individual and to being an iconoclast and to doing things her own way." Morrison says she follows her guts and her ears in her work. "I won't do anything unless I'm mad crazy about the music and the composer and really feeling like they're contributing something to the field that is different," she says. David T. Little says Morrison expressed this kind of excitement for his work Soldier Songs after she watched a video he sent her. "[She] called me almost immediately and says, 'We have to do this piece. I don't know where we're gonna get the money, I don't know how we're gonna do it ... but we have to do it!'" he says. Little says this moment was a perfect illustration of how Morrison works: When she's excited about something, she makes it happen. Their work together has continued: Last year, Morrison featured Little's post-apocalyptic opera, Dog Days, at Prototype, the annual festival she co-produces (with Kristin Marting and Kim Whitener of the arts organization HERE) to showcase new work. The 2017 festival begins tonight in New York. Morrison doesn't have her own theater. Instead, she partners with venues in New York and around the country to give works more than one hearing. "[Composers] need their works to be seen by as many people as possible," she says. "I feel like I've succeeded — particularly with an opera project, 'cause they're large and expensive — if we've been able to give two to five presentations of the piece in different cities." One project that achieved success by this metric was Mazzoli's latest opera, Breaking the Waves. Last fall, Morrison partnered with Opera Philadelphia to present the piece, and it's now being done at this year's Prototype festival. Kamala Sankaram, whose opera Thumbprint premiered at the first Prototype, will see it restaged at LA Opera this June, thanks to Morrison's efforts. Morrison's commitment to extending the life of her composers' works has made them just as passionately devoted to her as she is to them. Sankaram says Morrison's work is not easy. "To make contemporary opera your business takes a lot of guts," Sankaram says. "I don't want to go there too much, but there's still a lot of sexism in our field, and so for her to do this on her own is really kind of astonishing." Morrison's current season includes five world premieres, nine tours and her annual festival — all funded and produced out of her apartment-based nonprofit. Her schedule is certainly packed, but she says championing new composers has been intensely rewarding work. "It's been thrilling to be a part of the launch of these incredible composers," she says. "It really has been this symbiotic relationship that I feel very grateful for." Classical composers have long had their patrons. Beethoven had Archduke Rudolph. John Cage had Betty Freeman. 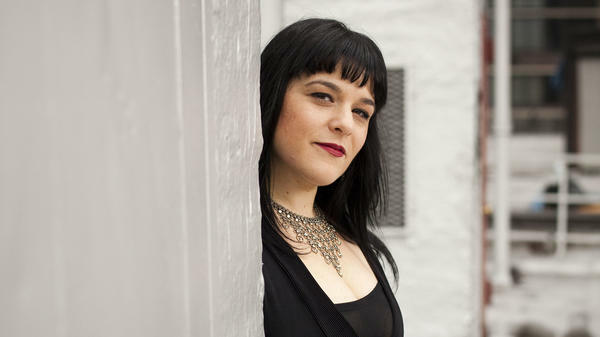 For contemporary opera composers, there's Beth Morrison. Morrison and her production company have commissioned new works from some of the hottest young artists today. Jeff Lunden has more. JEFF LUNDEN, BYLINE: Over a decade of covering music, I kept running into the same woman coming out on stage before performances or sitting in the theater during rehearsals. She was producer Beth Morrison, and she's not your typical patron. BETH MORRISON: I don't come for money, and I didn't have any money. And I wanted to live in New York (laughter). LUNDEN: She runs her empire from a two-bedroom, walk-up apartment in Flatbush, Brooklyn - one bedroom for her to sleep in, the other for her eight employees to work in. MORRISON: I've always run the business from my home maybe much to the chagrin of my board. But for me, the decision is always really clear. I could spend $30,000 to $40,000 on an office space every year, or I could put that into a commission. LUNDEN: She's commissioned works from such composers as David T. Little, Mohommad Firouz and Missy Mazzoli, whose first opera Morrison produced. UNIDENTIFIED SINGER #1: (Singing) There are 100 names for God. UNIDENTIFIED SINGER #2: (Singing) There are 100 names for God. UNIDENTIFIED SINGER #3: (Singing) There are 100 names for God. UNIDENTIFIED SINGER #4: (Singing) There are 100 names. UNIDENTIFIED SINGER #5: (Singing) There are 100 names for God. LUNDEN: Mazzoli calls Morrison in a true individual in every sense. MISSY MAZZOLI: In the way that she has a vision for her company, in the way she has a vision for her life, in the way that she dresses. You know, Beth has this famous boot collection that is just amazing. But you know, it's sort of a symbol of this commitment to being an individual and to being an iconoclast and to doing things her own way. LUNDEN: Beth Morrison says she goes with her guts and her ears. MORRISON: I won't do anything unless I'm, like, mad crazy about the music and the composer and really feeling like they're contributing something to the field that is different than what somebody else is contributing. LUNDEN: She was mad crazy about David T. Little's "Soldier Songs" after she watched a video he sent. DAVID T LITTLE: Called me almost immediately and says, we have to do this piece. I don't know where we're going to get the money. I don't know how we're going to do it, where we're going to do it, but we have to do it, which sort of sums up Beth's energy in a way, you know - this, well, we're just going to do it. We'll figure it out. We'll make it work. LUNDEN: And they've been working together ever since. Morrison featured Little's post-apocalyptic opera "Dog Days" at the annual festival she coproduces to showcase new work called PROTOTYPE. UNIDENTIFIED SINGER #6: (Singing) I miss our grass blade duets, the buzzing stems between our thumbs. I miss singing. LUNDEN: Beth Morrison doesn't have her own theater. She partners with venues in New York and around the country to give works more than one hearing because she says that's what composers need. MORRISON: They need their works to be seen by as many people as possible. And so for me, I feel like I've succeeded, particularly with an opera project because they're large and expensive, if we've been able to give two to five presentations of the piece in different cities. LUNDEN: Last fall, she partnered with Opera Philadelphia to present Missy Mazzoli's latest work, "Breaking The Waves." And it's being done at the current PROTOTYPE festival. UNIDENTIFIED SINGER #7: (Singing) His name is Jan, Jan, Jan, Jan - funny name for a man. LUNDEN: Morrison's commitment to giving works life beyond their original productions has made her composers just as passionately devoted to her. Kamala Sankaram, whose opera "Thumbprint" premiered at the first PROTOTYPE festival, will see it restaged at LA Opera this June thanks to Morrison's efforts. KAMALA SANKARAM: To decide to make contemporary opera sort of your business takes a lot of guts, you know, and especially to do it yourself as a woman. And I - you know, I don't want to go there too much, but there's still a lot of sexism in our field. And so for her to do this on her own is really kind of astonishing. LUNDEN: As for Beth Morrison, her current season includes five world premieres, nine tours and her annual festival - all funded and produced out of her apartment nonprofit. MORRISON: It's been thrilling to be a part of the launch of these incredible composers. And my work with them has helped them, and their work with me has helped me. And it really has been this very symbiotic relationship, you know, that I feel very grateful for.